Director Elijah Moshinsky on how Verdi’s Don Carlos vividly explores the human condition. Soprano Victoria Yastrebova models her costume as Elisabeth de Valois in Opera Australia’s production of Don Carlos. Many critics consider Don Carlos to be Verdi’s masterpiece. It was first written in French as grand opera and Verdi endlessly revised it – translating it into Italian. The debate among scholars still rages about performing versions. The full five-act French version complete with a ballet is very long and I believe that Verdi’s last Italian revision, which is in four acts, is the last word from the composer about this work. This is the version we shall be presenting. The four-act version of Don Carlos has a difficult shape but it is a unique masterpiece. I believe its greatness lies in its extraordinary breadth and clarity of vision of the human condition. Verdi denies us easy sentimentality in his portrayal of his characters. He explores the private emotions of the great and powerful as they face the insoluble dilemmas of the political world. As in many of his operas he investigates the inner world of private feeling against the forces of the public world and politics. Don Carlos struggles with the idea of religious tolerance and freedom against tyranny. This opera presents its action through the constantly shifting focus of five main protagonists. They experience life as a series of conflicting and unresolvable passions. Verdi’s characters are driven by the absolute imperative of passion. In the case of Rodrigo, Count of Posa and Don Carlos this is expressed as libertarian protest, the refusal of any form of subjection. For King Phillip II it means a drive for power that brooks no obstacle. For the Grand Inquisitor it is implacable loyalty to an order that must be upheld. Love is absolute for all the characters, but for Princess Eboli jealousy and vengeance become absolute when her love is thwarted. Like some irresistible force, these imperatives drive the characters onwards. Verdi was interested in humanity not abstract ideas. To illustrate the point, let us compare Verdi briefly to Wagner. Unlike Wagner, Verdi did not deal with world of myth or the metaphysics of music. The world may be a difficult place but not one which can be overcome by spiritual surrender to the sublime or the power of universal unconscious myths. Verdi was above all interested in the human condition. In Don Carlos, there is no such thing as Love-Death as in Tristan or spiritual redemption through music as in the Liebestod. No overwhelming orchestral outpouring is going to resolve the love of Elisabeth de Valois and Don Carlos in some heavenly symphonic paradise, no matter how beautifully they express their longing for each other. All this seemed ridiculous to Verdi, even though he undoubtedly borrowed a great deal, such as in his use of the recurrent musical motif to represent Don Carlos’ and Rodrigo, Count of Posa’s friendship. Don Carlos is an opera conveyed largely in scorching duets. Extraordinary characters facing the dilemmas of life through the expression of the singing voice. Unlike Wagnerian characters, Verdi’s characters do not declaim, they use melody as their instrument of thought. They still sing arias and ensembles. Despite its extensive range of thought and feeling, Don Carlos remains entirely a human work, concentrating on the dilemmas of real people. The real world is the arena of action and in it Verdi’s characters confront each other. These confrontations are vehement and combustible, often built on misunderstanding and often futile. A Verdi character such as Don Carlos would prefer catastrophe to compromise and defeat to reconciliation. The chain of actions and reactions that make up the plot, transforms these passions into destinies. Verdi portrays the inevitable enmeshments of his characters in such a way that the plot is like a forced march towards the outcome. It is like the force of destiny. There is one human quality that Verdi admired above all others – Greatness. It is present in his magnificent creation of the character of Phillip II. What Verdi loves above all is man’s struggle against the world. It is a struggle his characters know that is lost before it is begun, but whose nobility and failure he wants to show at one and the same time. This is not only true of Phillip II in this opera, but also of Rodrigo, Don Carlos and Elisabeth. There really was no other composer who created such great opera from moral debate and ethical questioning. Based on the play by Schiller, he is concerned with freedom and tyranny, the relation of power and responsibility, of ends and means in human actions and the challenge facing those called to act on the stage of history to preserve humanity and integrity. He stood against religious bigotry and state persecution through religion. In his depiction of the Inquisition in this opera where he fully expressed hatred for authoritarian religion. Perhaps only Tolstoy among his contemporaries has the same breadth of vision, sense of history and ability to enter the emotional world of his characters. Like Tolstoy, Verdi also allows room for his characters to philosophise about their struggle. They are self-aware. The staging of such a work is not an easy task. It is not just an ordinary opera. It demands extraordinary skills from the singers to inhabit the characters and from the director to create the drama. Moreover, it is inherently a static opera which demands the ability to create a wide palate of dynamic emotions. When considering the visual approach to the production, the designer Paul Brown and I resisted a purely historical approach. Traditional period drama would not be enough for this opera. It had to have grandeur. It needed the oppressiveness of the court. A world within a world. 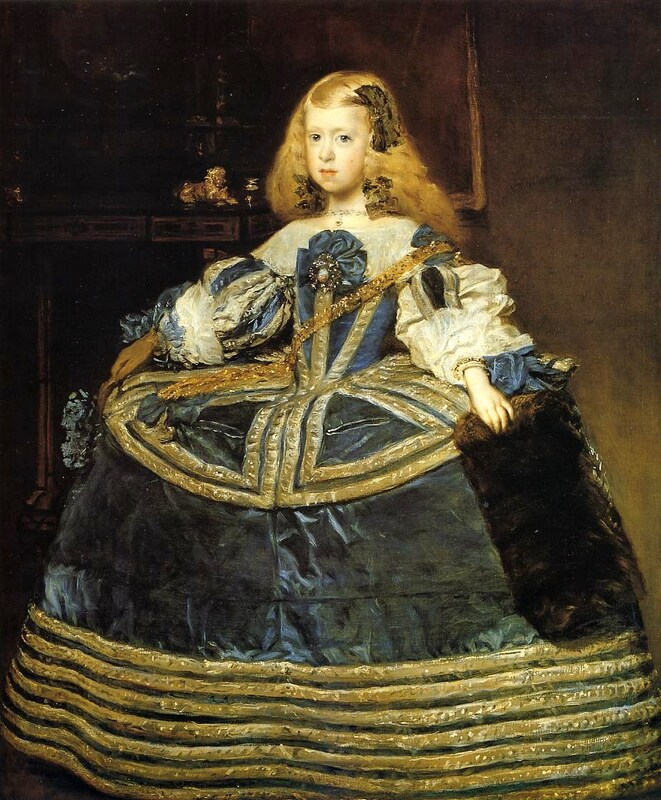 1659 Diego Rodríguez de Silva y Velazquez (Spanish painter, 1599–1660) Infanta Margarita in a Blue Dress. We found our visual clue in the paintings of the Spanish court by Velasquez. His paintings with their psychologically acute insights and their court formality express the essence of the world of the opera. The madness was there. Figures encased in costumes of silk that were in themselves a prison. We didn’t aim to recreate the paintings on stage but to suggest the world they inhabited. We wanted to create our own idea of the atmosphere at the heart of the piece. Visiting the Prado and sitting in front of these extraordinary paintings and then going to Phillip’s Palace of Escorial, I began to understand the sheer oppressive magnificence of the Spanish Baroque. The set begins in the mausoleum of St Yuste and the story ends there. The intervening scenes are constructed from fragments of that mausoleum, rearranged and added to in order create the other settings. The tomb is the overriding hidden metaphor of this production and every scene is a form of momento mori or constant reminder of death. Verdi’s majestic opera plays Arts Centre Melbourne from May 20 until May 29, and Sydney Opera House from July 14 – August 15, 2015. For more information and tickets, visit the Opera Australia website.